The Funky Felter: Please say a little prayer for Junior . . . Please say a little prayer for Junior . . . I wish that today was like any other Monday with me scrambling to start my week and making to do lists, but it is a little different this morning. Over the weekend my bunny, Junior, became very sick. My husband and I took him to the emergency care vet early Sunday morning. They prescribed him some antibiotics and gave him a shot to rehydrate him, but he is no better, if not worse, this morning. He doesn't want to eat or drink and is very lethargic. I made an appointment for this morning with his normal vet. I've been hoping and praying that he will recover fully. I hate to see him like this. It just breaks my heart and makes me weepy all the time. Please say a little prayer for Junior's health today. I would greatly appreciate it. 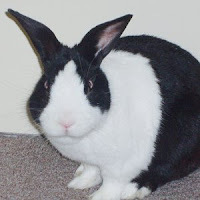 Hopefully, I can post some good news about my normally spunky bunny later on this week. UPDATE at 4:15 p.m. the same day . . . .
Well, during our vet visit today, junior had an x-ray to see if he had an obstruction. He doesn't which is a good thing. He just seems to have a lot of gas build up or bloat and some problems moving his food through his intestines. The doctor has recommended that we feed him liquids every hour as well as give him an antibiotic for his runny nose. And, if he is not eating and drinking on his own by tomorrow morning, I have to take him back to the vet's office for some alternative medication. As of this afternoon, Junior was quite a bit more alert and nibbling on some fresh green veggies and herbs. He still doesn't drink on his own, but it is a good start. Get well soon lil guy! Eat to make your mommy happy! Come on, just a few bites... there! isn't that yummy! Just been coaxing my cat to eat her special food from the vet. We can pray for Junior too! Aww, I hope he gets better soon! there's a group on flickr (http://www.flickr.com/groups/bunnyloversunite/), and I think they recommend tummy massages for gas. My bunny doesn't like to be picked up, so, I'm not sure how Junior would react.